No matter where you're advertising or what your goals are, WordStream Advisor has a solution to take the headache out of online advertising. Our 20-Minute Work Week analyzes performance across all of your campaigns and tells you what to do when for better results. Connect your Google Ads, Bing, and Facebook Accounts with the click of a button. Find opportunities, fix problems, and watch your results improve. We take the complexity and guesswork out of online advertising with intelligent alerts to optimize bids and budgets, pause poorly performing ads, improve ad text, and more! Plus, our automated success reports and easy-to-use dashboard ensure that digital marketers get the credit they deserve. I like that what took me hours in the past, now takes me 20-40 minutes. [...] We have decreased our CPC's cost by over 85%, increased our CTR by 371% and our conversion rate by 728%! Want to expand your marketing reach across new channels? We'll help you get started in just a few simple steps so you can build your successes without adding extra time and effort. If you're already advertising in multiple channels, we'll actually use your successes in one channel to inform our recommendations across all your campaigns. But They Should Be Doing This! 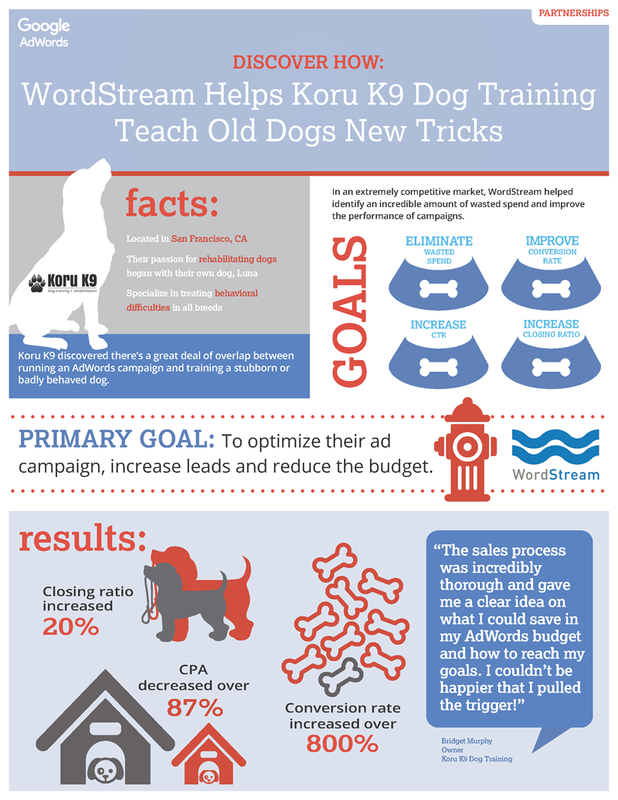 Working with WordStream, K9 Dog training has been able to virtually eliminate wasted spending, increase their CTR's and significantly increase their conversion rates. Sometimes, though, the real success of K9's campaign is not only evident in their dashboard, but also in the lives of the dogs and owners whom they have helped.